Free amino acids make up only approximately 2% of the total amino acid content of the body, with the rest being present as protein. 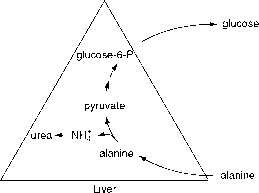 The concentrations of free amino acids are regulated largely by modulation of their catabolic pathways, although in the case of nonessential amino acids there is also some regulation of the rate at which they are synthesized. There is evidence that the rates of protein synthesis and degradation are regulated by amino acid supply, and that this is another homeostatic mechanism acting to maintain free amino acid concentrations within safe limits. Protein degradation is suppressed following a meal containing protein, and the rate of protein synthesis may be increased so that there is net storage of amino acids as protein. 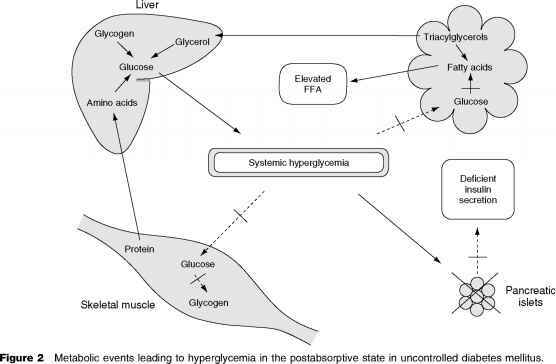 Subsequently, in the postabsorptive state the changes in the rates of protein synthesis and breakdown are reversed so that there is net release of amino acids from protein. In nongrowing adults these changes balance out over a 24-h period so that there is no net change in body protein content. The amplitude of these diurnal changes in the rates of protein synthesis and degradation appears to vary in direct proportion to the amount of protein that an individual habitually consumes. 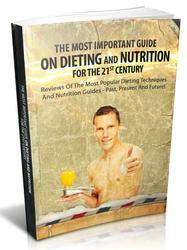 Free amino acids are found in all cells of the body and in extracellular fluid. They are transported between tissues in the plasma and into cells by a variety of transport mechanisms that are relatively specific for particular groups of amino acids. Amino acids are also present in red blood cells, but their role in interorgan transport appears to differ from that of plasma. For example, the plasma amino acid concentration increases as blood traverses the gastrointestinal tract after a meal, whereas the amino acid content of blood cells actually decreases. 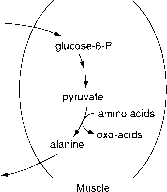 Figure 11 The glucose-alanine cycle.